Is this too much for the handicapped Super Series original? The McLaren MP4-12C reintroduced the brand to the supercar scene, going head to head with the Ferrari 458 Italia. It was a sterile scalpel compared to the junky-needle Ferrari, and it split the fanbase straight in half. The McLaren was as precise as you could hope for with a dual-clutch seven speed gearbox and twin turbo 3.8L V8, blowing higher priced machines out of the water with quicker lap times and better livability. Thanks to that, prices have been steady since it was released, but is it all enough to justify paying $97,500 for a damaged example that's stuck in Limp Mode? Let me start by saying that the seller was completely upfront with the issues. The body damage was well documented in the Bring a Trailer ad with over 100 photos in the gallery, showing exactly where the blemishes were. The listing also states the car's mechanical problems right off the bat, so this wasn't any type of swindle or bamboozle. 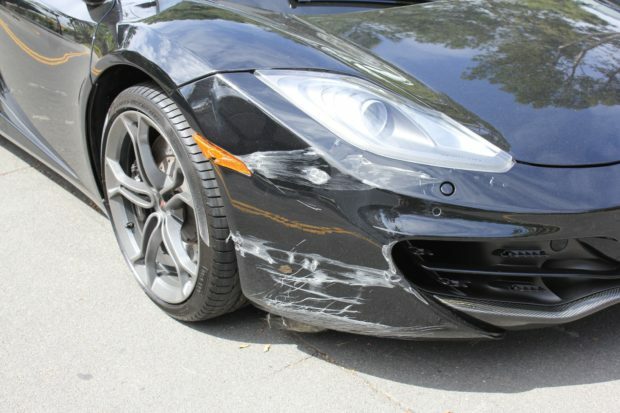 The seller states that this McLaren starts, runs, drives, shifts, and sounds normal, though it is currently in Limp Mode with the ABS, ESC, check engine, parking brake, TPMS, and airbag warning lights on as shown in the photo gallery. The extent of the damage and current problems have not been fully diagnosed. The seller’s shop installed a new suspension component that was bent during the accident, but states the steering wheel remains off-center and that the car needs a full alignment. With that being said, the car still went for $97,500. A showcase finish bumped the price from some-$60,000 in the final thirty minutes, showing that someone really wanted the car. It's a nicely optioned example with loads of carbon everywhere and a handsome black-on-black finish, so with the proper fix, it'll be a stellar machine for the buyer. Perhaps, instead of this being a shock that someone would spend so much on a broke-down supercar, it speaks for how well the MP4-12C has fared in the collector's market. The car seen here has traveled 18,743 miles, and cars in good shape with similar usage are going for nearly $150,000. At that rate, $97,500 seems to be a pretty hefty discount. What do you think of this auction? Fairly priced or outrageously high? Let us know in the comments or on our Facebook page! The driver confused forward and reverse.